← Backpackers? Who Needs Their Tourism Dollars? Boat manufacturer’s are planning to show new designs this year. Winter weather may be unpredictable in Michigan, but outdoor enthusiasts can count on one thing: there is always a robust lineup of outdoor shows planned which can help to pass the winter months. Fourteen are scheduled between now and spring. Each is tailored to a specific audience, from campers and paddlers, to boaters, hunters and anglers. Show producers say they expect a good turn-out this year. Consumer confidence has grown and manufacturers hope to catch that wave by showing their latest designs and products. “I expect things will be up a bit,” said Ben Nielsen, manager for the Ultimate Fishing Show Detroit, the gateway event for the outdoor show season. It opens January 8 at Suburban Collection Showplace in Novi. The Ultimate Fishing Show is the largest all-fishing show in Michigan. Hundreds of exhibitors have products on display. It also boasts a four-day lineup of seminar presenters who will cover tactics and gear for all kinds of fishing. New to its seminar stage is Captain TJ Ott, star of National Geographic Channel’s hit show, Wicked Tuna. Ott will present twice each day on January. 9 and 10. He joins a line-up of Michigan’s Fishing Who’s Who on the stage, including bass tournament super-star, Kevin VanDam, who appears three times on January. 9. Retro RVs are in. 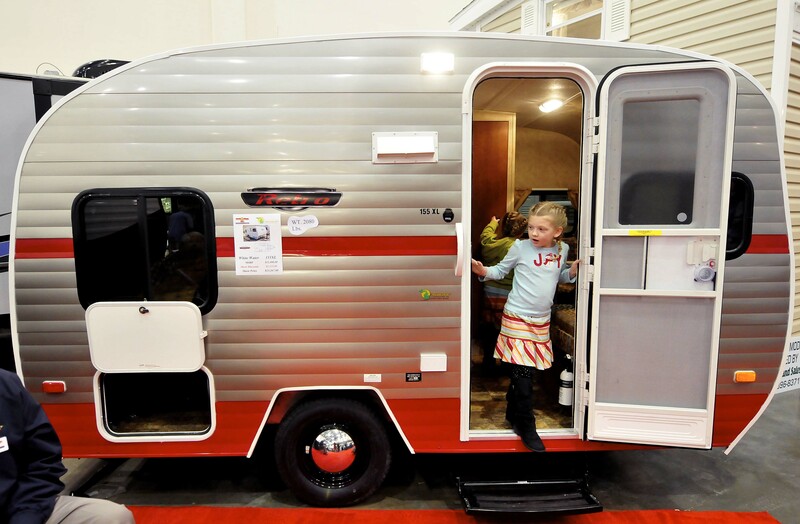 More will be seen at the Grand Rapids Camper, Travel & RV Show. Photo: Showspan. The RV industry is also gearing up for a good show season, predicting better sales. Skift.com, recently reported that Airstream, the venerable trailer manufacturer, plans to expand production by 50 percent soon. The industry overall, has been recovering from the Great Recession. A “Winter 2014” report by the Recreational Vehicle Industry, a national trade organization, predicts 2014 RV sales will be more than 8 percent above 2013, followed by nearly four percent growth in 2015. The four-day event is a showcase for the RV lifestyle. Visitors can compare a wide assortment of units, from tiny travel trailers to larger-fifth wheels, van conversions and luxury motorhomes. Its seminar stage is where visitors learn about RV living and travel. The 2015 lineup includes presentations by acclaimed RV-travel film-maker, John Holod, and by Shari Galiardi & David Hutchison, a couple who restored a 1957 Sportcraft trailer and took to the road two years ago. Boat enthusiasts can also expect more and bigger displays at shows this year. Boat manufacturers are optimistic about the economy. The National Marine Manufacturer’s Association reports power boat sales in 2014 were up 5-7 percent over 2013. Further growth is expected in 2015. That optimism fueled the development of new designs, some of which should appear at Michigan boat shows this year. “We expect attendance to go up this year, barring any weather challenges. 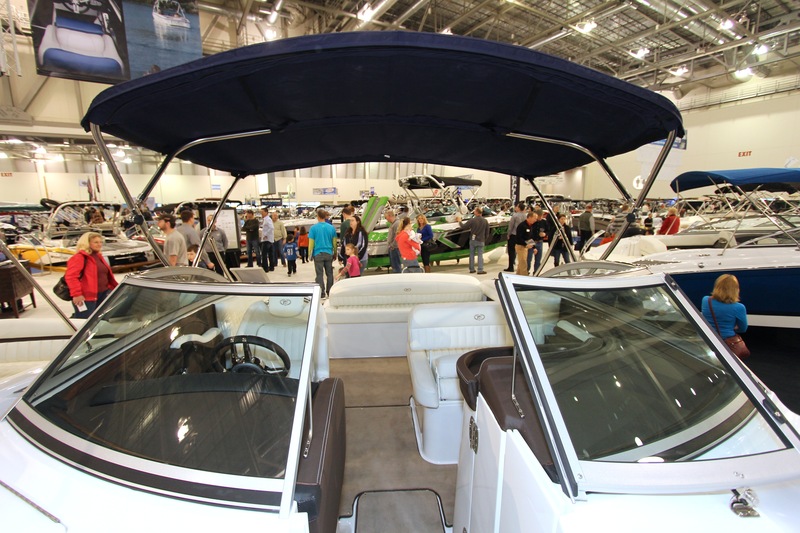 We are also expecting boat sales to continue to increase,” said Nicki Polan, executive director of Michigan Boating Industries Association, the marine trade organization that puts on the Detroit Boat Show at Cobo Center in February, and a Spring Boating Expo in Novi come March. The Detroit show has grown from 200,000 square feet of exhibit space in 2012, to 350,000 feet in 2015, according to Polan. “There still is a lot of pent-up demand and boat sales are benefiting now that the economy is improving,” Polan said. Grand Rapids Boat Show producer, Henri Boucher, agrees. “We’re back to having a full house,” Boucher said, about the Grand Rapids show that opens February 18 at DeVos Place. “The show is packed. Booth space is sold out. Michigan’s Outdoor Show Season offers a good mix of events, some larger, some smaller, some catering to niche audiences. If you’re looking to break up the winter months, or want to hunt for a good deal, take look at the upcoming show calendar and make plans to have some fun. Jan. 15-18: Grand Rapids Camper, Travel & RV Show, DeVos Place, Grand Rapids: showspan.com. Jan. 23-25: Huntin’ Time Expo West, The Delta-Plex Arena, Grand Rapids: huntingshows.net. Feb. 13-15: Michigan Deer & Turkey Expo, The Summit Sports and Ice Complex, Dimondale: deerinfo.com/michigan. Feb. 26- Mar. 1: Outdoorama – Suburban Collection Showplace, Novi: showspan.com. Mar. 14-15: Midwest Fly Fishing Expo, Macomb Community College Sports & Expo Center, Warren: midwestflyfishingexpo.com/. Mar. 19-22: Ultimate Sport Show Grand Rapids, DeVos Place, Grand Rapids: showspan.com. This entry was posted in Uncategorized and tagged Adventure Travel, Boating, Boats, Camping, Canoeing, Fishing, Fly Fishing, Hunting, Michigan Boating Industries Association, RVs. Bookmark the permalink.